Can you confirm these amateur observations of Oxyrhopus vanidicus? Oxyrhopus melanogenys — CAMPBELL & LAMAR 2004: figs. 1215, 1229. Types Holotype: ICN-MHN = ICN 10683 (original field number, JMR 4106), an adult male collected by Juan Manuel Renjifo on 13 May 2003. Diagnosis Diagnosis: A species of Oxyrhopus distinguished from all others by having a color pattern of triads and by lacking a pair of short dark bands on the nape. Comment Synonymy after LYNCH 2009. Etymology Latin, meaning liar; used in allusion to the apparent mimicry of this species with the venomous coralsnake, Micrurus hemprichii. Sánchez-C, H., O. V. Castaño-M, and G. Cárdenas-A. 1995. 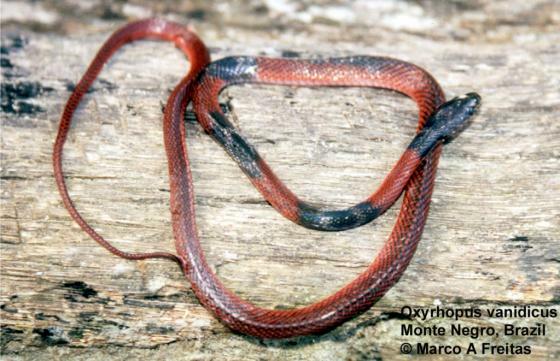 Diversidad de los Reptiles en Colombia. In: Rangel-C, J. O., editor. Colombia Diversidad Biótica I Bogotá. Colombia Editorial Guadalupe. pp.<br />227–325.